As my girls get older, I keep an eye out for interesting writing programs that might help us on our journey. I was intrigued by the opportunity to review Beyond the Book Report, a new program from Analytical Grammar for middle school to early high school aged students.. This program includes three "seasons," with a corresponding teacher packet and DVD for each one. I received all three seasons to review. Seasons 1 and 2 are perfect for 6-8th grade students, and Season 3 is most appropriate for 9th grade. Season 1 includes the Basic Book Report, the Pamphlet Book Report, and the News Article Book Report. Season 2 includes the Poetry Book Report (writing four types of poetry, learned in the lessons, about your book) and the Drama Book report. Season 3 is the longest one, and has the least "fun" writing assignments: The Essay, the Oral Book Report, and the Research Paper. Throughout each project, students learn how to follow rubrics to complete the assignments. The skills and literary terms learned in each project are incorporated into the next. You can start anywhere you need to in the program. There is a lot of information on the product page regarding what is taught in each lesson. If your student doesn't need to complete Season 1, for example, you could easily begin with Season 2. 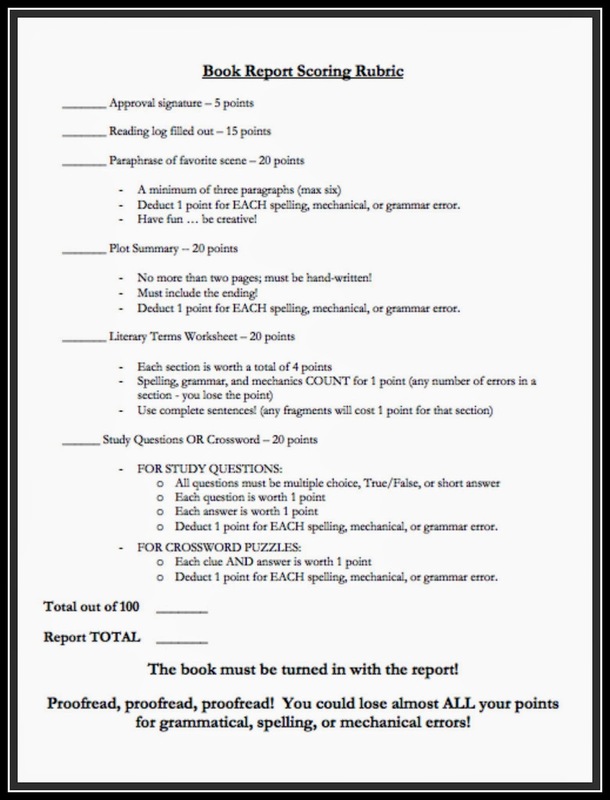 Beyond the Book Report is written to go along with the Analytical Grammar program, but works just fine as a stand-alone writing program. In the teacher packet, each assignment is broken down step-by-step, and you know exactly what to do on each teaching day. 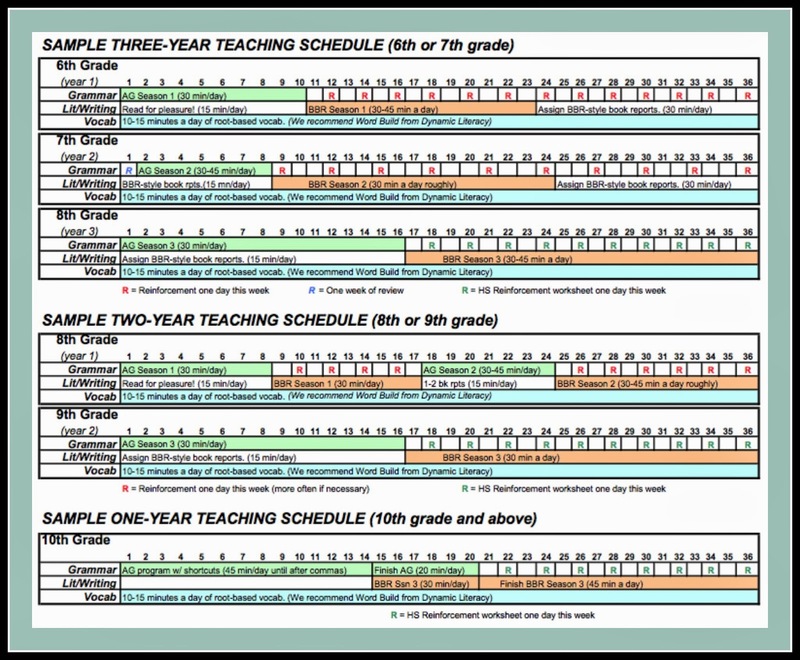 There are sample schedules provided so you can see how they suggest using the program with various ages. For high schoolers, they suggest going through it in a year, but I'm not sure how I feel about that. It would really depend on the length and difficulty of the books they chose, I suppose. We would be more likely to complete the program in two years. The only thing missing from the printable items on the DVDs is a PDF copy of the story, "The Tell-Tale Heart" by Edgar Allan Poe, used in the Essay project in Season Three. Both teacher and student need to read it, so you need a minimum of two copies, and if you have more students, you'll need more. I do have a scanner that will allow me to make a copy, but it would be easier to have it ready to print. Otherwise, everything you would need to print of for your students is there. I helped my two girls each choose a book and get started. I had them do a quick written narration after each chapter they read, so they'd have that to look over when they got ready to do their summaries. We took the rubric and broke the number of pages down into how much they'd have to read each day to get done in time, and they each kept a reading log, as instructed. As the teacher, I now see why we're instructed to set deadlines and stick to them, because we didn't get as far with the project as I'd hoped we would. They finished all the reading and kept their logs, but we're still working on the other pieces of the project. We all learned a lot in this process that will make it easier to work through the rest of the projects. In retrospect, I probably should have had them choose shorter books. As Charlotte Mason homeschoolers, we don't read through books at a fast pace. Normally, we would only read a few pages, perhaps a chapter, in each sitting, and then write or give written narrations after each reading. To keep pace during the review period, they read longer sections and sometimes had to write more than one narration in a sitting. That wasn't their favorite thing to do. Because we do tend to read books more slowly, we would be more likely to take this program at a slower pace, even though my girls are older (going into 8th and 9th grades). Overall, I like this program a lot. The videos might not have the most professional feel, but the instruction is good, and as a teacher, I learned everything I needed to know to teach my students. We've not done much formal writing, because we have worked on mostly written narrations, so it was good to have explicit instructions. The course does have a bit of a school-ish feel to it, with the reading logs and such, but the rubrics do show the students exactly what's expected of them for each part of every assignment. Beyond the Book Report is available from Analytical Grammar for $69.95 for the bundle of all three seasons, or you can order each season individually for $24. 95.